We offer a comfortable homestead, sleeps up to 7. In Kakahi, a sleepy village in the adventure playground of Ruapehu. Our 257sqm, C J Allen Homestead is the oldest house in Kakahi, built in 1905. A few renovations later sees the house as comfortable, well positioned and inviting. The historic village of Kakahi is well known for it's trout fishing, Manu's authentic country general store, the glow worm cutting, and inspiring acclaimed New Zealand artist Peter McIntyre. Kakahi is an easy drive to many adventures in the region. Kakahi Adventure Lodge provides a place where time stands still. The lodge sits at one end of the village, is private, sunny and peaceful. The night sky is vast and unspoiled by light pollution. You will enjoy the following facilities; log fire, heat pump, electric blankets, linen and bedding. Fully equip kitchen, including breadmaker, microwave, crock pot, yoghurt maker, and large fridge. Washing machine, freezer, library, games, cleaning products.. Fire wood, beer fridge, bbq, outdoor chairs and tables, picnic settings, tent sites, blokes party shed - ladies allowed. Kakahi is a small, sleepy, friendly village that will call you back time and again. A wave to all and frequent visits to Manu's shop are must do activities! Pick up can be arranged from the Taumarunui bus station or the National Park railway station. 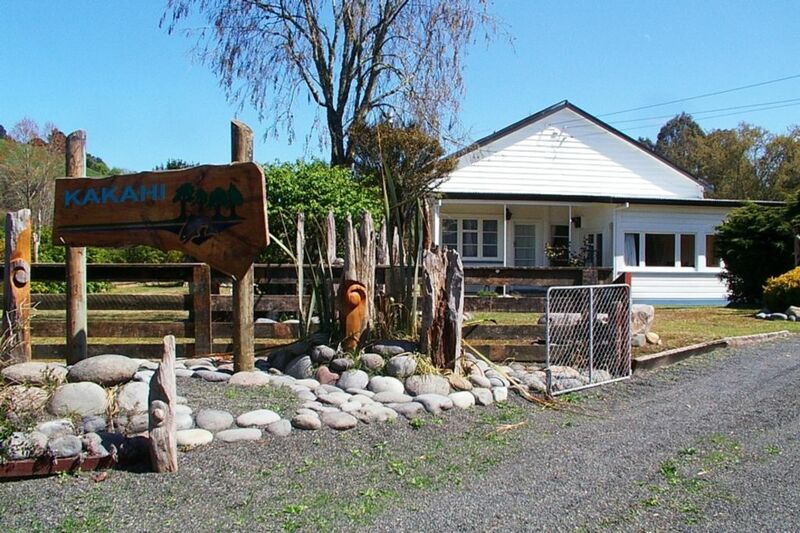 The driveway to the lodge should be entered and exited from the village end of Waitea Branch Road. Cars pulling out of the driveway straight across the road are risking a collision with a car coming round the corner. ALWAYS exit to the eastern, or village side of the driveway. I have lived in Kakahi for 8 years. After meeting the lovely Mike, I left my corporate Auckland job, sold my house in the hills and embraced a life of peace and quiet in the beautiful countryside. I love it! I spend my time in my large gardens, and looking after my lovely grandchildren, Konna and Evie. Mike is a born and bred Kakahisian. He is an ex railway worker and qualified Tree Surgeon. Mike loves rusty old things, railway memorabilia, a good yarn, old tractors, motorbikes and beer. The house is the one time homestead of Mike's grandparents, and the house he grew up in, so it has very special meaning to us. We have worked hard to breathe new life into the house and maintain it's unique feel. The house seems to come alive when there are people in it! Mike and I are both well traveled and enjoy meeting travelers. We have a simple life philosophy and are very much into sustainable living. We try to maintain a small footprint on the earth and your assistance in this is hugely appreciated. Be aware that once you have visited Kakahi, you will want to come back! The tranquility and sleepiness gets into your being! We look forward to seeing you soon. Kakahi is centrally located between Wellington and Auckland. We are also 2 hours to 4 main centers. We have 2 major fly fishing rivers on our doorstep, and many many outdoor adventures nearby. The house is clean, comfortable and spacious. It is private, fully functioning and super relaxing. Genuine 1970's decor and style. Turn off your devices and sink in to Kakahi time. we are unable to help with this item as we are not tv literate! Funky bach in funky village. Will be back soon (and I'll bring my fishing rod). Fantastic quiet location handy to nearby fishing spots. Very nice tidy lodge with cool 70's style. The location was great - it was nice to be outside National Park and to have a direct route to Ruapehu. Kakahi is a very peaceful place to stay. Kakahi is a very peaceful place to stay. Beautiful with glimpses of the snow covered mountains. Mike was helpful about the fishing and Manu at the store sold me a couple of killer nymphs. Fishing was great and the Whakapapa River is only a short drive away.